Before you can zero your rifle scope on your gun you first have to mount it securely. For that you can check out our How To Mount A Precision Rifle Scope Guide. As with everything in life, there’s a few ways to zero a rifle scope. This short guide will show you how to zero a rifle scope by using paper targets and shooting rounds at a shooting range. Repeat the firing and adjusting until you hit the top spot dead-center. Do not rush this step. It can take a while to get the scope adjusted and you need to have patience. You will have the scope zeroed at 25 yards when you hit the target dot consistently. Remember that with each distance you will need minimal adjustments. Try to get a feel for the adjustments you make to zero at the different distances or even write it down. 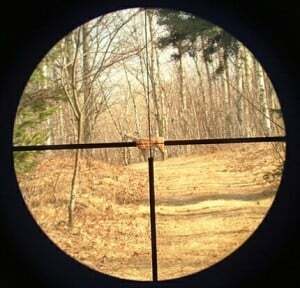 This will help you adjust when you’re out hunting and you see your game at a distance that you haven’t zeroed in your scope. Have a look at our rifle scope reviews to find the best riflescope for your shooting and hunting preferences.